At first glance, horse barn aisle footing seems to be more of an aesthetic choice. We’re drawn to an attractive look at a decent price. But consider this; the barn aisle is a high traffic area. Horses, handlers, wheelbarrows, tractors, and perhaps a barn dog or two all jockey for position in your barn aisle. You’ll want to choose a floor that is safe, offers good traction, is durable, and is relatively easy to keep clean. Shock absorption is important as well. Wow. That’s a tall order, but hold your horses. All this and a beautiful look can be yours. Let’s look at some of our traditional choices in barn flooring as well as some that offer a more modern, elegant look. Brushed concrete, dirt, compacted gravel, stone dust, and asphalt are probably your least expensive flooring options. Dollar for dollar any one of these will save you money in the short term, but they have their drawbacks. Brushed concrete, while relatively slip-resistant, is extremely abrasive so if a horse (or human) should fall, skin abrasions are almost a given. Brushed concrete is impossible to sweep clean, but can be blown out with a leaf blower. Asphalt is a decent barn aisle flooring option, but it isn’t all that pretty. Dirt, stone dust, or a mix of gravel and stone dust are all economical options as well. Dirt floors offer good drainage, traction, and minimal impact on equine joints. Tidying up is accomplished with a leaf rake. A big step up from a dirt floor is the rubber mat option. 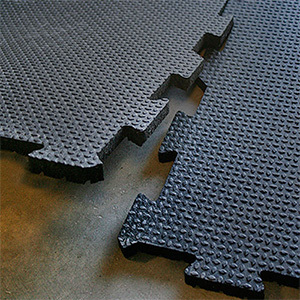 While slightly more expensive than a dirt floor, rubber mats offer good traction, durability, ease of installation, and are easy on the joints. Usually installed over a firm base of compacted stone dust, clay, concrete, or asphalt, quality rubber mats will last for decades in the barn aisle. Interlocking mats which take the guesswork out of installation are a great choice. Interlocking mats will not pull apart or move around so they’re perfect for barn aisle traffic. 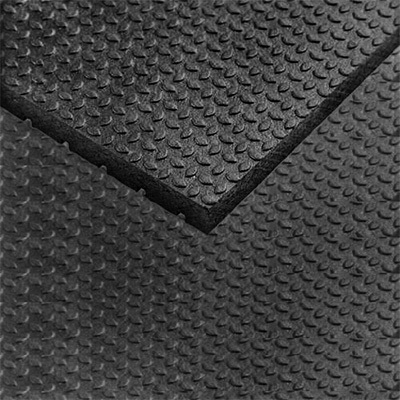 All mats are not created equal, however, so look for mats that are constructed of 100% re-vulcanized rubber for durability. A ¾” thickness works well in the barn aisle. Interlocking rubber mats offer your horse an anti-fatigue surface, are durable in all weather conditions (even in extreme temperatures), and are super easy to install and clean. Rubber pavers are a popular choice for barn aisles and for good reason. They’re beautiful, durable, shock absorbing, and easy to install. Offered in black or terra cotta, these pavers make for an elegant barn aisle look. Better yet, rubber pavers offer great traction. Horses seem to love them. 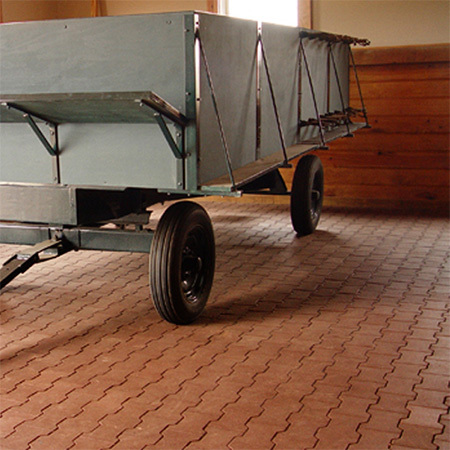 Rubber pavers also absorb sound, creating a soft and quiet barn aisle environment. Pavers won’t chip or crack like asphalt or concrete and are easy to clean with a leaf blower. Rubber pavers can be placed on just about any type of base, but crushed limestone seems to work well both for drainage and easy cleaning. RAMM rubber paver bricks are manufactured in a 7 x ¾ inch dog-bone shape that interlock with adjacent pavers. The pavers are easily cut to size with a band saw, chop saw, or cut-off saw. A firm sub-base is critical for proper installation of rubber pavers. We recommend excavating approximately 12 inches of soil below the required finish level of the paver floor. Replace excavated soil with about 9 inches of compacted stone base. Crushed limestone is a good choice, offering excellent drainage and good ammonia absorbing properties. Pavers can be installed over concrete and other solid surfaces, but any solid surface will require a perforated drain to prevent moisture build-up. Rubber mats and pavers are best installed if the temperatures are on the cooler side as these materials tend to expand in warm, moist temperatures. Rubber pavers require a little bit of planning to make sure everything is straight, but they have the added advantage of minimal waste in materials when all is said and done. Oil-based hoof products will stain pavers and mats so these should not be used in the aisle. Climate may influence your decision as well. It can be difficult to find asphalt contractors during colder months in the northern climates. Frost heaves are a risk with asphalt and concrete in the northeast. RAMM’s rubber pavers are easily cleaned and stand up well to extreme temperature changes so consider them for people walkways, equine walkways, wash areas, entrances, and even garden paths and driveways. They offer a truly elegant look to the inside and outside of any barn and farm. Barn aisle flooring is an important choice. It’s one that you’ll be living with for a long time. Choose a flooring that offers good traction, durability, shock absorption, and, of course, one that is easy on the eyes. 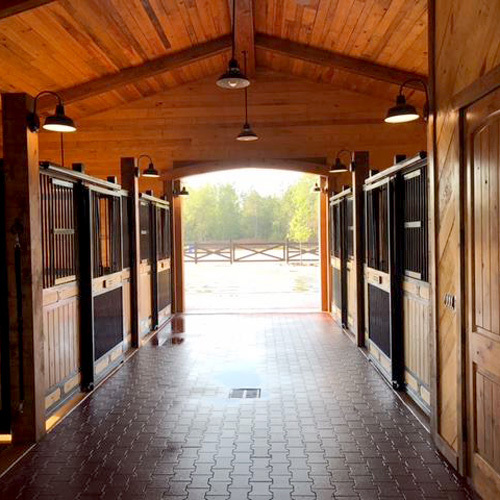 A smart choice in barn aisle flooring can add that final designer’s touch to your dream barn. RAMM Horse Fencing & Stalls has been a leader in the industry for over 30 years. The company is owned and staffed by people who own and love horses. Recognizing that every project is unique, the staff at RAMM help customers plan projects, evaluate benefits and costs, and are always there to provide tips and help on installing products. 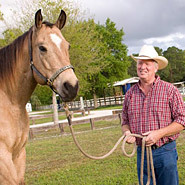 Visit RAMM at rammfence.com, on Facebook, or check out our new blog; YourHorseFarm.com. Of course, you can always give us a call at 800-434-8456.